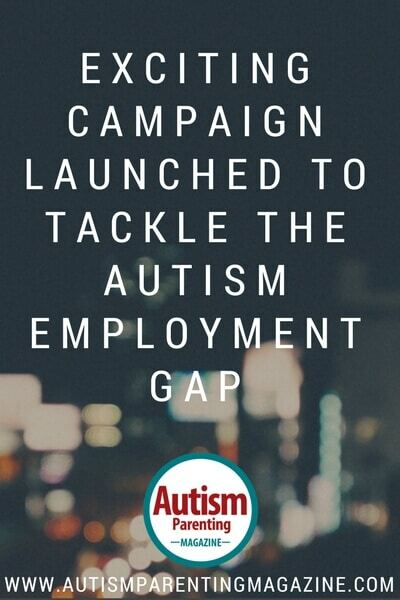 It will be some time before we see a positive result, but the opening shots have been fired in a campaign to encourage the UK Government to tackle the autism employment gap once and for all. High-flying politicians, like Government Minister Penny Mordaunt, have come out in support of the UK’s National Autistic Society (NAS), which is spearheading the initiative to raise employers’ awareness of the skills and potential of autistic people. To date, just 16% of autistic adults in the UK are in full time paid work—a figure that has virtually remained the same for the past 10 years, highlighting the fact that those with autism are not benefitting from government employment programs. This is something that NAS is determined to change and is now calling upon the government to introduce specialist support to help autistic people find and stay in work as well as to launch a national program to raise employers’ awareness of the skills and potential of autistic people. Employers can play their part, too, by accessing the Society’s resources and working to become autism-friendly employers. The Society unveiled its Autism Employment Gap Report at a Parliamentary reception held in the House of Commons when Penny Mourdant, Minister of State for Disabled People, Health and Work, pledged her support for the campaign, saying that people with autism and those with learning difficulties were often talented and creative entrepreneurs who had achieved amazing business success stories. She undertook to support doubling the number of autistic people in work, to make sure that those with the condition could access specialist autism support and vouched to help raise awareness of autism among employers. Earlier that day, the Minister had announced the government’s new consultation on disability employment, an initiative that asks for feedback on how the disability employment gap could be reduced. Since then, almost 30,000 people have signed a NAS petition—the charity’s biggest ever—giving their views on how to tackle the issue and calling on the government to take decisive action to double the number of autistic people in work by 2020. That’s sending out a message, loud and clear, that action needs to be taken. Delivering the petition to Disabilities Minister Penny Mourdant, MP Cheryl Gillan—who chairs the All Party Parliamentary Group on Autism—said she was proud to present such an important petition to the government. Also present at the handing over of the petition was campaigner Arran Linton-Smith, a 60-year-old senior consultant in the construction industry, who was diagnosed with autism just a few years ago. According to Mark Lever, chief executive of the National Autistic Society, the UK government has been sent a “powerful message” by 30,000 people who were asking that autistic people be given the chances they deserve. He commented, “A growing number of employers, like Microsoft, are actively looking to employ autistic people who can have strengths such as tenacity and thinking differently. But many businesses tell us they don’t know where to go for support and they’re worried about getting it wrong. The Government’s White Paper on improving the disability employment rate is an opportunity to open up the workplace for autistic people. They must listen to the voices of autistic people, including the people who’ve signed our petition, and introduce autism-specific support to help autistic people to find and stay in work. Not all autistic people are able to work. But many are and are desperate to find a job which reflects their talent and interests,” he added. I had the pleasure of attending the Commons reception together with my nephew, Andrew Iredale, and his mother, Mrs Pamela Iredale, who are co-owners of Seasons Restaurant in Leamington Spa. They have taken up the challenge by providing employment opportunities for young people with learning difficulties and offering dedicated time for quality dining for those with conditions like autism. “There were also encouraging words from National Autistic Society, and hopefully more employers will now start to appreciate the talented individuals that autistic people are—and the credit that they can be in the working environment,” he added. Meanwhile, in a move that highlights the positive power generated by charities such as the National Autistic Society, the UK Government has confirmed that from September, 2018, every new teacher in England will have to learn about the needs of autistic children and young people as part of their teacher training. Seven thousand of the charity’s supporters have backed a campaign calling for special educational needs and disabilities—and autism in particular—to be included in the new Initial Teacher Training framework. This means that for the very first time, every new teacher in England will have a basic understanding of autism and the different ways it can affect students. This is fantastic news, indeed, for the autism community—and a decision that will make a huge difference in the lives and prospects of generations of children on the autism spectrum. Now, NAS is calling on the governments of Northern Ireland, Scotland, and Wales to follow suit. Fred Bromwich is a freelance journalist and former magazine editor based in Central England, whose nephew, Josh, was diagnosed with autism.